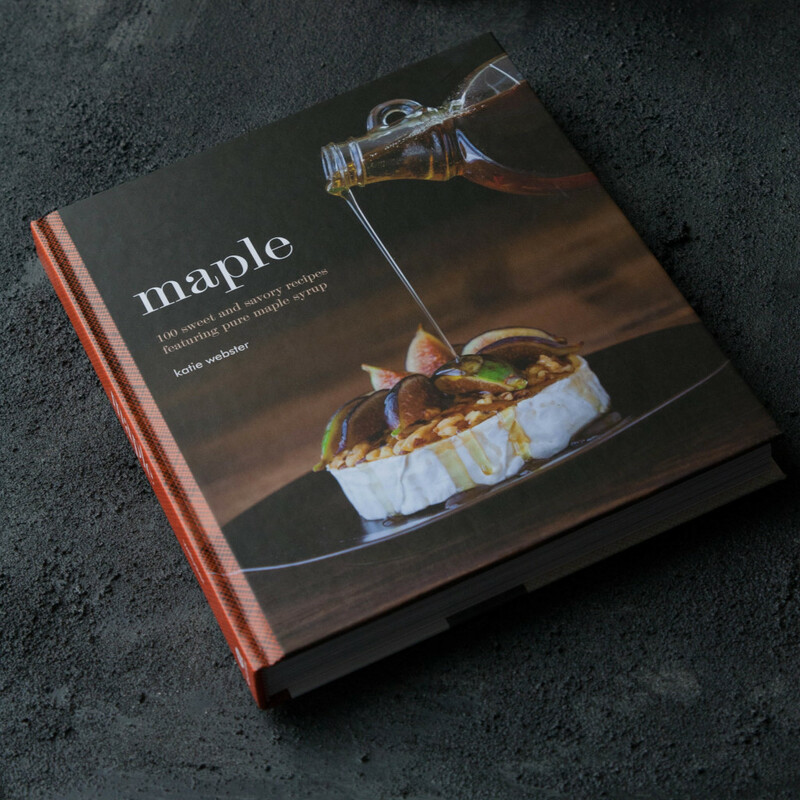 I’ve been thinking about maple more often than usual because of Katie Webster’s first cookbook, Maple: 100 Sweet and Savory Recipes Featuring Pure Maple Syrup. Several months ago a mutual friend introduced us and I agreed to assist her during a 48 hour turn-around trip from Vermont to San Francisco. When she offered to send me her cookbook to explore more, I happily accepted. 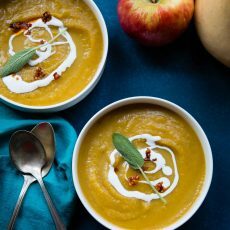 On Katie’s blog, Healthy Seasonal Recipes, she shares recipes rooted in the seasons with a healthy perspective. She shot all of the photos in her cookbook. As a former food stylist for Eating Well Magazine, she knows how to take stunning photos that give healthy food gorgeous appeal. Katie was flying out from Vermont to San Francisco to demonstrate a few maple recipes at a librarians conference. 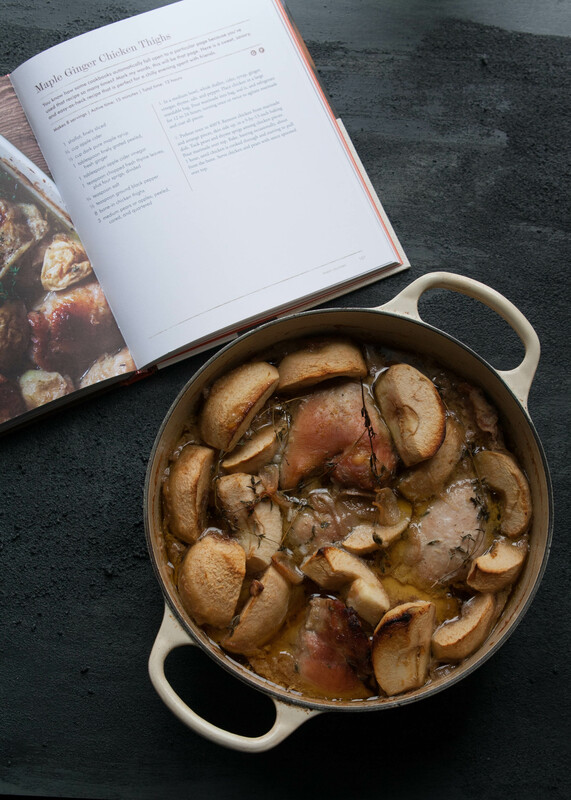 When we initially discussed recipes to demo, she teased out the recipe for Maple Ginger Chicken Thighs commenting how this recipe wooed anyone who made it. We ended up going with two other recipes, but the chicken stayed in the back of my mind, bookmarked. 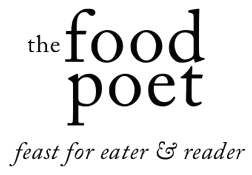 Writing a first cookbook includes its own ebb and flow. There are long solitary stretches where the cook works to perfect the recipe in their kitchen. Then, in come the reinforcements in the form of recipe testers, editor, and friends for support. I’ve had my fair share of helpers, so I was excited to help another first-time author as she thrust her book out into the world for the first time. I prepped all the ingredients and packed parts of my kitchen to haul over to the Moscone Center for her cooking demo at the librarians convention. She showed the group how to make her Maple Walnut Chocolate Chunk Cookies (p. 134) and Maple Sour Cherry Shirley Temples (p. 52) as several of us distributed samples for attendees to taste. 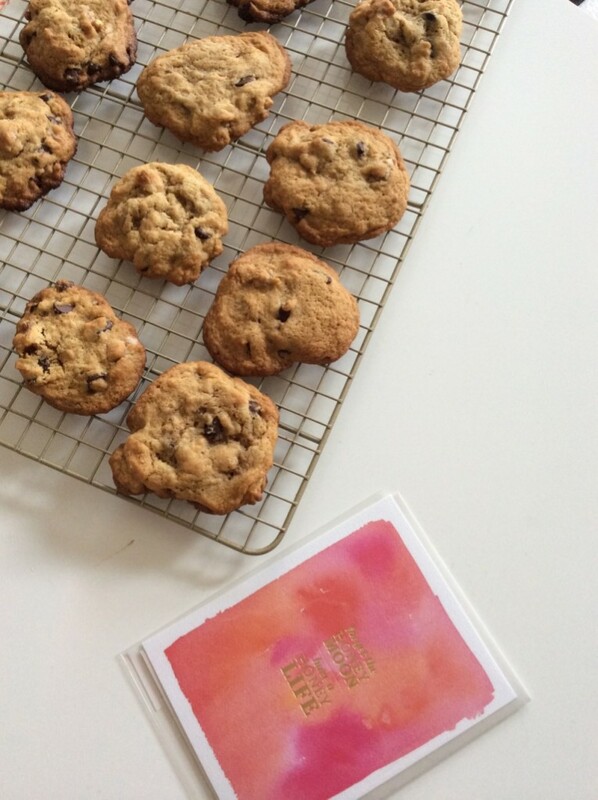 The maple walnut chocolate chunk cookies can be made with dark or white chocolate chips, but take it from an avid dark chocolate fan, I heartily suggest eschewing the dark and going for white. The test batch below shows dark chocolate. The white chocolate didn’t last quite so long… White chocolate brings out the caramel accents from the maple sugar in the cookies that bake up crisp around the edges and moist in the middles. Katie’s maple sour cherry Shirley Temples were a revelation. I had made a test batch when I first received the recipe and this drink has been modified for adult palates, balancing the sweetness of the maple syrup with sour cherries and a bit of almond extract. This drink made a believer out of me and escalated my curiosity to try Katie’s other maple-laced recipes. The book categorizes the recipes by type, making it easy to hunt down drink recipes, breakfasts, main courses, and desserts. I began marking pages as soon as the book arrived that I’m planning to make this fall like Easy Maple Turkey Breakfast Sausage (p. 22) and the Overnight Whole Grain French Toast Bake with Dried Apricots and Chèvre (p. 30) that I’m eyeing for Christmas. I learned that every winter Katie and her family tap trees in their yard and then process the sap through backyard sugaring that includes a 500-pound evaporator parked in their driveway. Katie takes the reader into understanding the differences between grades of syrup and even offers substitution tips for swapping in maple syrup in place of other sweeteners. Growing up in Texas and then living in California, it’s all too easy to look at a bottle of maple syrup and not see the connection to the land, especially when considering the cost. This ingredient is big business in Vermont and Northern America with direct links back to family-owned businesses. 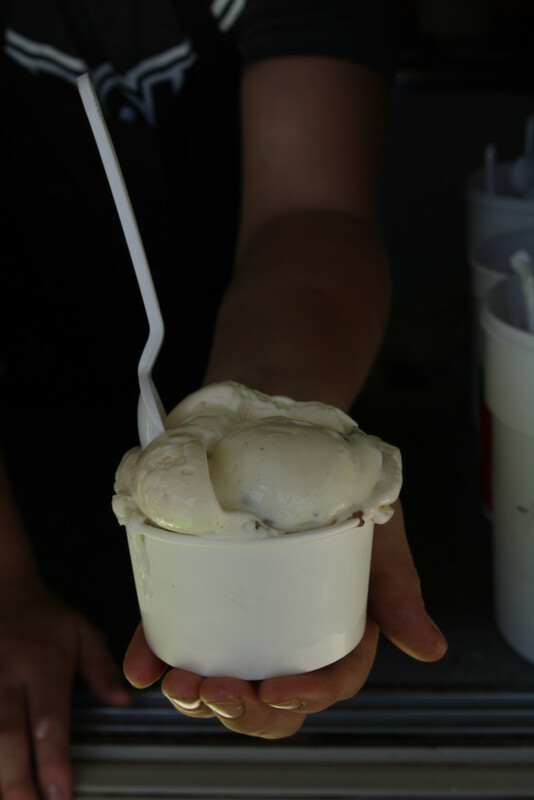 In reading Maple, I began to appreciate so much more than just the flavor. And that brings us back to chicken. These chicken thighs marinate overnight for a comforting main course that fills the house with the aroma of fall. I totally understood Katie’s promptings this summer that this chicken would woo and win over anyone who tried it. It really is a bit of a ringer recipe. I adapted it ever so slightly with a few substitutions. We use kosher salt in our house, so instead of using 3/4 teaspoon iodized table salt as indicated in the recipe, I swapped in 1 teaspoon kosher salt. The recipe called for bone-in chicken thighs, but I ended up using skinless, boneless chicken thighs because that’s what I could find at my local market. 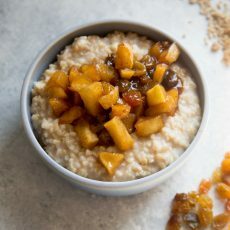 She gives the suggestion to use pears or apples, but we decided to keep the apple love fest going strong to pair with the apple cider and apple cider vinegar. I made a pot of polenta and steamed some carrots to serve alongside. 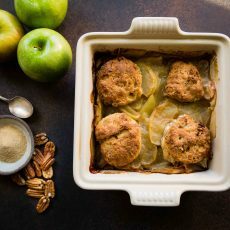 In the end I’m thinking all this dish really needs is a cold evening outside with the oven heating up our home and the smell of ginger, apples, maple, and poultry permeating every nook and warming us up. (adapted ever so slightly) Reprinted with permission from Maple: 100 Sweet and Savory Recipes Featuring Maple Syrup by Katie Webster, published by Quirk Books. Preheat oven to 400F. Remove chicken from marinade and arrange pieces, skin side up, in a 9-by-13-inch baking dish. 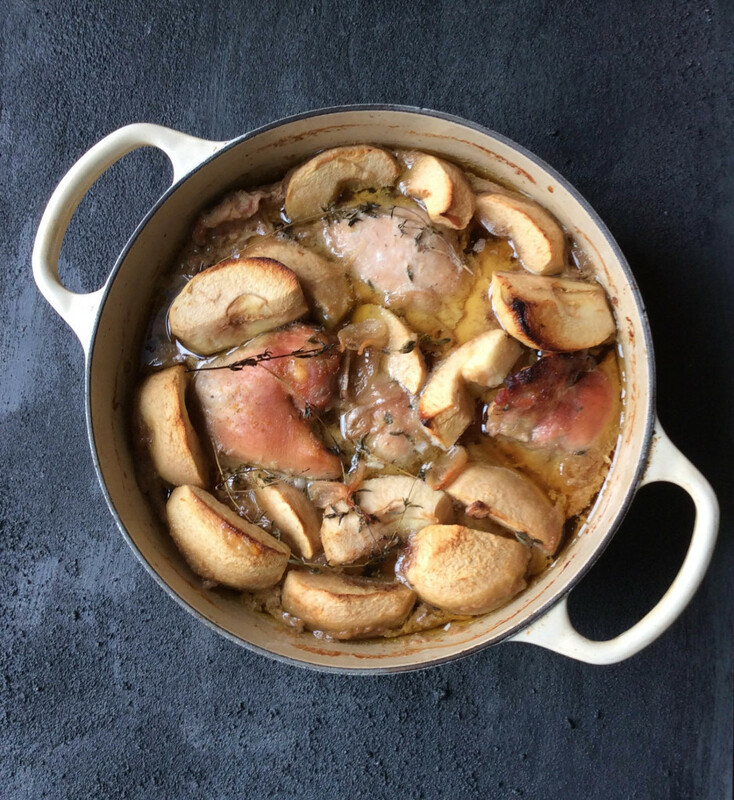 Tuck pears and thyme sprigs among chicken pieces. Pour marinade over top. Bake, basting occasionally, about 1 hour, until chicken is cooked through and starting to pull from the bone. Serve chicken and pears with sauce spooned over top. I love everything that you said here and that you shared the story of how we met, and our whirl wind demo at the Moscone Center. I am so thrilled you love the book and thank you so much for sharing it with your readers. Cheers my friend! It’s a wonderful book, Katie. I made the Sweet Potato Maple Pecan Streusel Coffeecake for a potluck recently and shared slices with neighbors who asked for the recipe.